Our cob roundhouse, which was begun in spring last year, has just been finished this week, in time for its inauguration party to be held on the evening of the summer solstice. Sharka, Kate and Jo putting the finishing touches to the living roof. The floor laid and woodburner installed to complete the interior. We'd like to thank all the local, national and international volunteers who attended the four cob building workshops this year and last - and special thanks go to Jo Forsyth for leading the workshops and the build. You have all created something very special. The first of our summer produce has begun to trickle in to our farm shop, veg boxes and farmer's market stalls - climbing French beans, tomatoes (mostly Sungold), sweet peppers, aubergines ("long purple"), broad beans, globe artichokes, strawberries, and fresh basil. Plus we have new potatoes, kale, chard, dried chillies, cucumbers (and crystal lemons), courgettes, thubarb, fresh coriander, oregano, fennel, and other fresh herbs. Helen, from the USA, here digging new potatoes (on the left, with Mira on the right), left the farm this morning to continue her wwoofing adventures across the UK. Thank you Helen for your help on the farm over the past three weeks, and we hope you enjoy the rest of your summer. 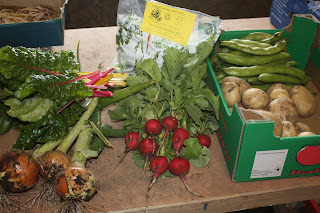 Small (£6) veg box - our own new potatoes, the first broad beans of the season, rainbow chard, rhubarb, herb fennel, and organic courgettes from Crowlas. Standard (£10) veg box - new potatoes, broad beans, courgettes, rhubarb, herb fennel, red Russian kale, chard, fresh coriander, and a head of wet garlic. On Wednesday 22nd June we dug up the first of this season's new potatoes, Maris Peer, 3 months after planting them. Our own stored potatoes ran out three weeks ago, and since then we've had one week without potatoes, one week with bought-in new potatoes, and now we have our own in veg boxes and for sale in our shop and farmer's market stalls. Hand digging the first new potatoes. And here are some photos of this year's potato plants in Four Acre field, showing the difference in foliage and flowers between the five varieties we have planted. Sarpo Mira blight tolerant potato plants. Gilles and Sophie, from the south of Belgium, also left us last Monday, after two weeks volunteering on the farm. Here they are after having picked the first of this season's strawberries. Good luck up in the Lake District, and we hope you enjoy your next farm. Small (£6) veg box - sugar snap peas, red Russian kale, rhubarb, cucumber, organic courgettes from Crowlas, organic new potatoes (Colleen) from Cockwells. Standard (£10) veg box - red Russian kale, resh basil, chard, "crystal lemon" cucumber, rhubarb, fresh coriander, organic courgettes from Crowals, organic new potatoes and cauliflower from Cockwells. Pierre, from France, left the community farm last Monday, after six weeks wwoofing with us. We're very grateful to Pierre for his hard work and enthusiasm during his stay, and we wish him all the best on his onward travels. 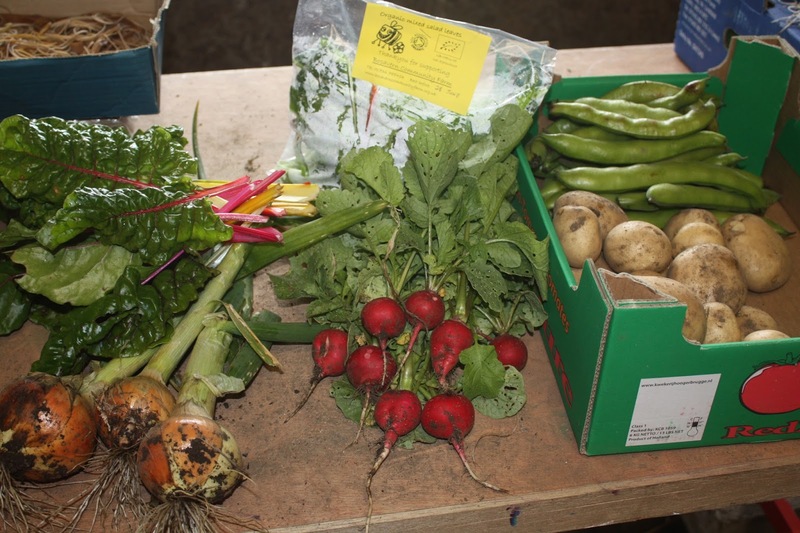 This week is the five-year anniversary of our first ever veg box at the end of June in 2011. Since then we have produced veg boxes every single week, and have built up our customers from two to almost forty. Many thanks to all our customers, past and present! Our first ever veg box (one of two) - rainbow chard, salad leaves, red radishes, overwintering onions, broad beans, and new potatoes. These are crystal lemons, a variety of cucumber (yes, seriously!) that we're trying for the first time this year. They are very distinctive, smaller than our Passandra cucumbers, are a "burpless" variety, and tast just like a......cucumber. Buy one in our farm shop and try it for yourself. Small (£6) veg box - red Russian kale, fresh basil, cauliflower, courgettes, rhubarb and cucumber. Standard (£10) veg box - cauliflower, fresh basil, red Russian kale, radishes, salad leaves, cucumber, courgettes, sugar snap peas, and rhubarb. Our cob roundhouse is in its fourth and final phase of construction. The cob workshops are being led by Jo Forsyth, and have been attended by a mix of local, national and international volunteers, some of whom are camping on the farm. The cobbing crew plastering the outside of the roundhouse. A communal lunch in the farmyard. Yesterday we used the tractor to lift loads of topsoil onto the roof to turn it into a living wildflower patch. Anybody wishing to come along and join our team working on the cob roundhouse please phone the farmhouse on 788454, or turn up at 9am on weekdays or Saturdays ready to start. 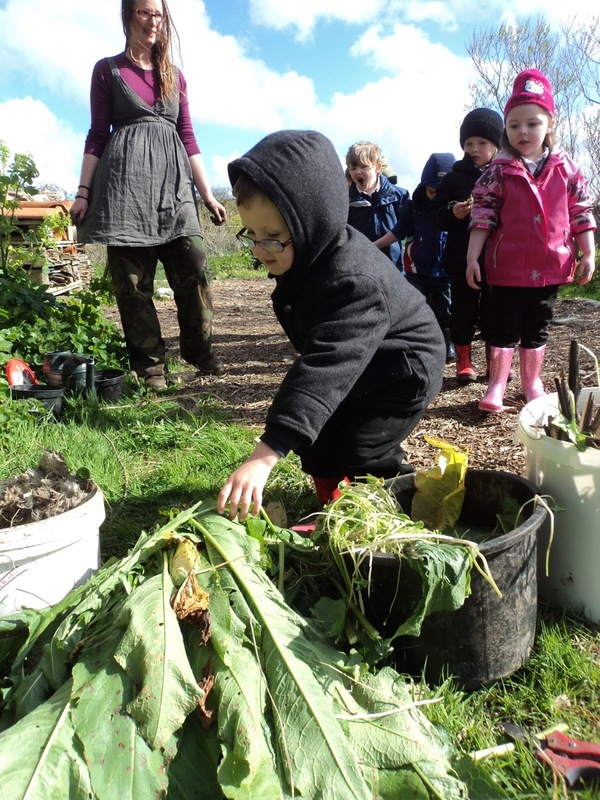 The community farm is currently running a "Gardening in small spaces" course on Saturday mornings, with ten local participants, and yesterday was the third of six sessions. 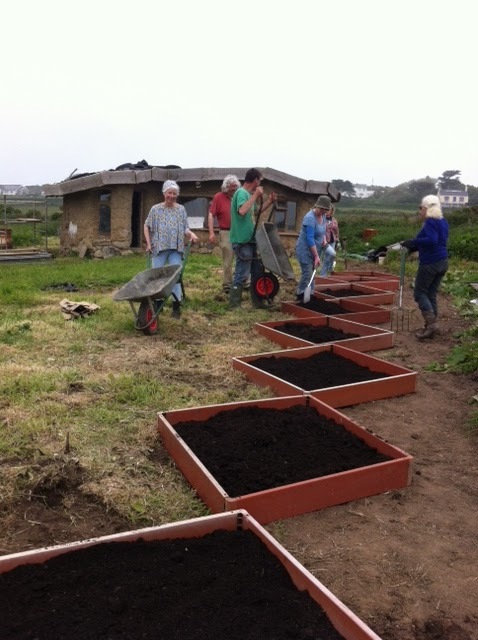 The course is being run by Ian Willsdon, who has many years experience as an organic gardener and allotmenteer, and is a member of the farm's volunteer board of directors. This photo shows the first session, with participants setting up their one-square-metre raised beds near the cob roundhouse in Home Field, and filling them with municipal compost. Since then plants have begun to go into the beds, and more are being prepared ready. Many thanks to Ian for volunteering to run this course (and for everything else he does for the farm too! ), and for the participants for coming along and getting stuck in. 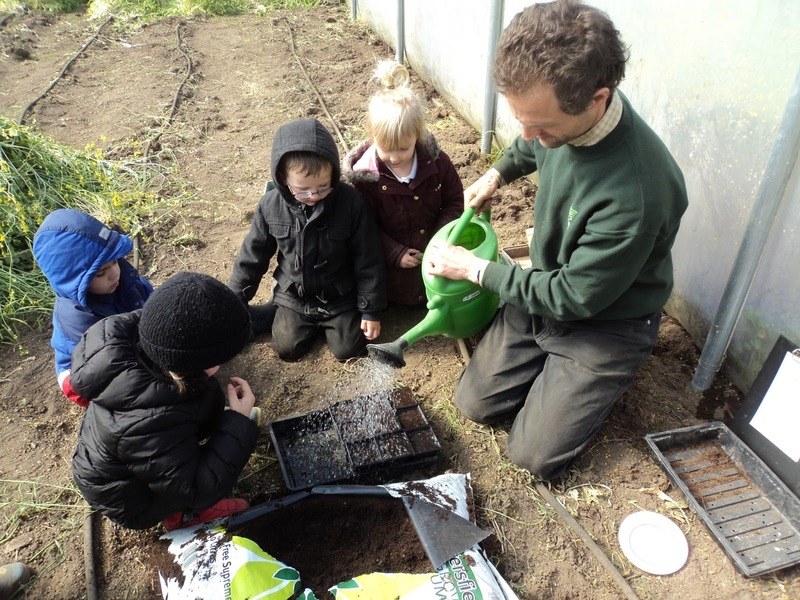 - Sowing pumpkin seeds and tasting different vegetables in the polytunnels. Each visit lasted two hours, after which the students returned to school and helped prepare then eat soup cooked from vegetables grown on the farm. Feedback from Pensans School has been excellent - all the students enjoyed their visit, and we enjoyed hosting them too. We'd like to thank our volunteers for helping with the visits, the school for coming, and teachers and parents for allowing us to use these photos. Our small (£6) veg box contained a cauliflower, 1kg of Valor potatoes, 200g red Russian kale, 200g chard, 3 courgettes, and a cucumber. The standard (£10) veg box contained a cauliflower, 2kg of Valor potatoes, 200g red Russian kale, 200g chard, 3 courgettes, a cucumber, 50g fresh basil, 100g mixed salad leaves, and 150g sugar snap peas. Noemie, a wwoofer from Belgium, left the farm this morning after 2 weeks volunteering with us, and we'd like to thank her for her hard work on the farm, and wish her well in her onward endeavours. 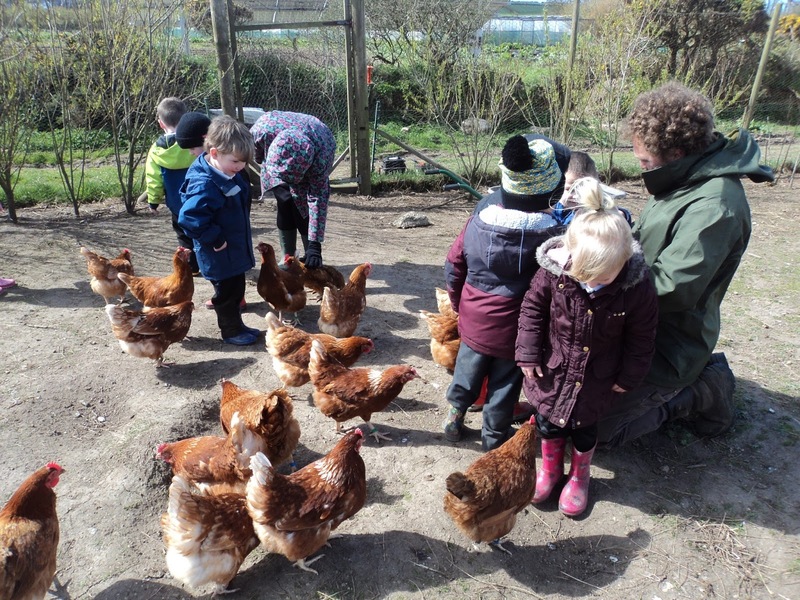 Yesterday was Open Farm Sunday, a national event aiming to increase popular awareness of what farms do and where food comes from. This is the second year running that we have taken part, and this year we were visited by about 70 people. It was a hot sunny day and we had plenty of cake! Despite the hot day we still had a campfire in the farmyard, just for the enjoyment of it. Plus our ever popular cafe, with cake, pizza slices, soup, biscuits, tea and coffee. A tour of the market garden took in polytunnels, outdoor cropping, and the fruit cage. A tour of our cob roundhouse, now approaching completion. Craft workshops and face painting in the farmyard. A big thank you as always must go to our wonderful team of volunteers who helped make the day so affirming and enjoyable, and to everybody who came to support the community farm. Small (£6) box - 1kg Valor potatoes, cucumber, purple sprouting broccoli, wet elephant garlic, chard, herb fennel, and spring greens. Standard (£10) - 2kg Valor potatoes, cucumber, wet elephant garlic, chard, spring greens, rhubarb, mixed salad leaves, and sugar snap peas. Amandine, from Brittany in France, volunteered as a wwoofer on the farm for 3 weeks, and left us recently to head to her next farm near Glastonbury. Many thanks for your help! Amandine weeding in the market garden.